There is one rural church in Madison county that probably longer and more continuously associated with the history of the county than any other. That is the Elm Grove Methodist church down in the southeast corner of South township. At this late day, local historians are fortunate in locating one man, a former resident, who was associated with that congregation at its very beginning here. Now living in California, Cal Ogburn, has written a history of that church to be filed in this county’s historical archives. This story is based upon Ogburn’s story. prominent member, Norval S. Allcock, who then lived where the town of Hanley is now. Among the other families making up the congregation were the Rays, the Ogburns, the Allens, the Grays and the Johnsons. For several years the services of this congregation were held in Allcock’s log cabin home. The organization was included with five others in Madison and Warren counties and constituted what was known as the Three Rivers Mission. The Rev. George W. Teas was the circuit rider in charge. In the fall of 1851, Norval Allcock sold his farm at Hanley and purchased Hiram Hurst’s second homestead in Secs. 20 and 29 of South township. When he moved to his new location, which was a mile east of the present Elm Grove church, he took with him the meeting place of the Methodist organization, of which he was the most prominent member. As the county settled up and the congregation grew, the group started meeting in a little log school house in that vicinity. The original Elm Grove church building was not built until 1866. Even at that date, its construction must have been at great sacrifice to the pioneer congregation, for its cost was $1,500, and that was a great deal of money in a frontier community where there was very little cash. Furthermore, the tenants of the Methodist faith required that the building must be three-fourths paid for before it could be started, and must be completely free of debt before it could be dedicated. Although the building was completed in 1866, it was not dedicated until four years later. 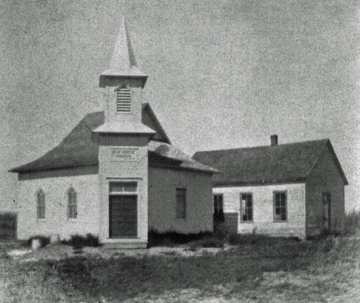 Thus, the original Elm Grove church was built in the spring and summer of 1866, mostly of native material, with the members of the congregation doing most of the work. The building was of frame, with native walnut furnishings. Its specifications were 24 by 36 feet, and it was built on a site donated by Barnabus Ray, grandfather of Cal Ogburn. Four years later, on June 19, 1870, the edifice was formally dedicated. The pastor at that time was the Rev. E. A. Winning. The dedication sermon was preached by the Rev. H. H. O’Neal, of Winterset. This page was last updated Thursday, 04-Apr-2013 13:46:58 EDT .